AVweb's John Deakin devotes this month's column (and next) to his favorite charity, hobby and passion: the just-renamed Commemorative Air Force. Deak tells of the organization's need for pilots, mechanics and volunteers, and discusses one of CAF's newest acquisitions, a beautifully restored C-131 (military version of the Convair 340 airliner). This column, and my next one, are a little different, and serve several purposes. First, it is an unabashed pitch for my favorite charity, hobby, and passion, the Commemorative Air Force. Ok, what's that? Why, it is the Confederate Air Force, under its new name, as of December 7, 2001! It's been a long road, and a controversial one, too, but the deed is done. Lloyd Nolen, the founder of the old CAF, very strongly stated decades ago that the "Confederate" in the name carried too much baggage with it, and was not politically correct long before the term "politically correct" was invented. Everyone who has ever tried to recruit a new member has had to spend an inordinate amount of time and energy explaining that we have nothing to do with slavery, the war between the states, segregation, or discrimination. It seems to be a surprise to some that the Confederacy didn't even have an air force. Even after hearing the explanation of how the name came to be (a bunch of good ole Texas boys spray-painted it as a joke on a surplus Mustang, forty years ago), many still refused to have anything to do with the organization, in spite of the fact it's now a world-renowned museum of flying WW-II aircraft (recently extended to Korean War aircraft). We also honor the history and service of those who served in any way, whether building the aircraft, maintaining them, or flying them. World headquarters is in Midland, Texas, with more than ninety units scattered all over the USA, and a few overseas. There are about 140 aircraft, with about 120 of them flying, at least one example of almost every type that served in WW-II, including the world's only flying B-29. Two years ago, a vote was taken to decide whether to change the name at all. It was hotly discussed, and there are still those who rail against the affirmative decision, with strong words against "political correctness." It seems futile to point out to them that we were losing millions in donations and financing, purely because of the name. A common comment by the rest of us is, "Very well, if you'll just write a check for a million or two, maybe we can keep the name." No takers, only talk. The rest of us feel the name is far less important than the mission. I'm a bit sad at the loss of a grand old name that is known around the world as a first-class flying museum, but hoping the the change will make it easier to recruit new blood, and more donations. Four names were selected, and the general membership voted on them during AIRSHO 2001, at Midland, Texas. The vote is done, the name is official, let's move on. A couple years ago, I wrote a column here titled "Warbird Crews Wanted." In that column I bemoaned the difficulty we're having finding volunteers to keep these old airplanes flying. The situation grows worse by the day, for the WW-II people are mostly gone now, and the rest of the old prop pilots and mechanics are either retired, or have mostly been polluted, poisoned, and perverted by those dreadful jets. I think there's something about the stench of jet fuel that kills brain cells, at least those relating to piston engines and props. Why, just show me a jet that will raise the hair on the arm the way an old radial will, coughing to life! New CAF hangars at CMA. I am privileged to work mostly with the Southern California Wing (SoCal, for short) of the Conf... er, ah, the Commemorative Air Force located at the Camarillo, Ca. airport. In fact, I moved there from Seattle to be closer to it. In the opinion of many, it's the finest unit in the entire organization. We've put up and have mostly paid for two brand-new hangars, each capable of holding a C-46 or B-17 comfortably, and will be putting two levels of offices around all three sides of each of them soon. 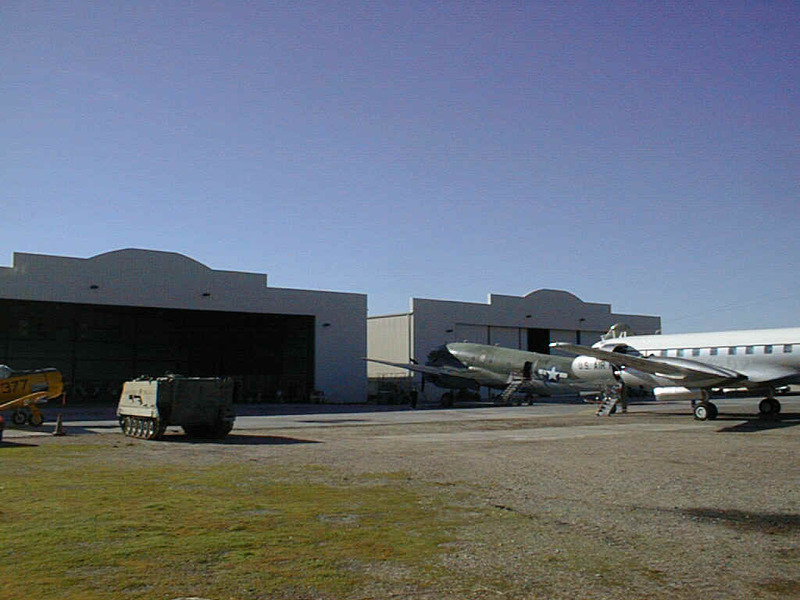 One is the museum hangar, the other the maintenance and restoration facility. A collection of books and artifacts gathered over more than 20 years is now on display, and growing better by the day. We have a Curtiss-Wright C-46 ("China Doll"), and a North American SNJ/AT-6 flying to shows regularly, and we do a lot of training on both. We have a beautiful Grumman F8F Bearcat that's a favorite at shows, but since it has only one seat, we don't do much training in it! We have a North American B-25 well along in restoration (help wanted! ), another AT-6 in pieces, but pretty complete (help wanted), a genuine Mitsubishi Zero needing major restoration to fly again (it flew in for an annual, and we discovered some real problems). We also have regular visitors that stay around a lot, like the Grumman F6F Hellcat, the FM2 Wildcat, and others. There are rumors we'll be restoring a P-38, we may acquire a Mig-17, and finally, we have a brand-new airplane for us, a Convair C-131 (military version of the Convair 340). More about that one later. 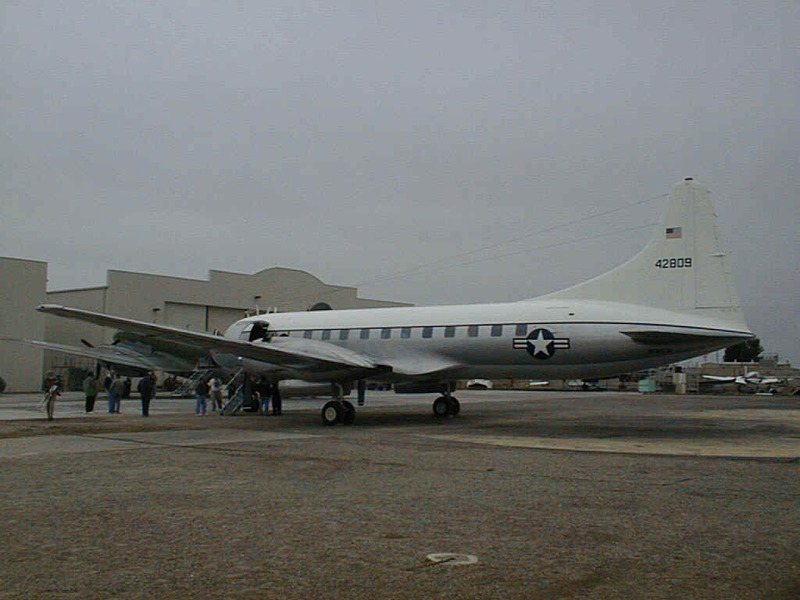 We've also got "Tinker Belle," the other C-46 belonging to the Commemorative Air Force, here for some much-needed work and restoration over the winter (help wanted!). If you have any interest at all in aviation, old airplanes or history, it's hard to imagine that you wouldn't have a ball helping out in some way. Official workdays on the airplanes are Tuesdays, Thursdays and Saturdays, but increasingly, folks are showing up on other days, too. The museum is open 10 to 4, six days a week (closed Monday), and is in need of docents, people to act as guides, and answer questions, or just simply greet visitors at the entrance, relieving others to take folks on tours. Most of the questions are pretty easy, and very often one of the older visitors can answer the more difficult ones. Visitors generally get a tour of the entire facility, and get to enter some of the airplanes. Recently, the folks working Sundays have had to call around to members, asking if they can PLEASE come out for a few hours, and help. I keep wondering if some of the retired folks in Camarillo and the surrounding areas wouldn't make wonderful docents, and we're trying to figure out how to reach them. Perhaps a few will stumble upon this column? Working around the old airplanes has kept a number of oldsters young and alive, and we love having them around! Mechanics. Oy, do we need mechanics, even unskilled ones who can work under supervision. Note that such time can be credited towards the requirements for getting an A&P certificate. We need all types of expertise, in just about any field. Some of our guys are doing the construction work on the offices that will go around three sides of the hangar, some do plumbing, and one fellow is installing the entire phone system. Some days, there are enough people to work on some popular projects (B-25, for example), but others, there may be only one, who can't do much without some help. We need just plain volunteers, too. All the CAF airplanes are running short of people to go along to airshows, to spend a couple hours a day collecting money, selling memorabilia, or just do crowd control around the airplane. We all pitch in and help wherever we're needed most, but more and more, we're short-handed, and we go to shows with empty seats in the C-46, and probably in the C-131 (once the novelty wears off) next season. A few years ago, every seat was full. Several weeks ago, a pleasant young stranger named Scott Holm walked in around lunchtime, and quietly asked about donating an airplane. Someone pointed him at Steve Barber, who happened to be there that day. Steve is one of the main sparkplugs in the organization, and the fellow mostly responsible for raising the money for our new hangars. His enthusiasm, energy and positive attitude absolutely work wonders. Turned out that Scott and his father Barry (a businessman in Florida) had purchased the airplane as a derelict in Tucson some years ago, and had it restored to mint condition by Western International Aviation there in Tucson. It later won "Best Transport" at Sun&Fun, a real tribute to the immaculate restoration. It has been based for several years in Stuart, Fla., flying to nearby airshows. "What the heck is a C-131?" I had to think about it myself! It's the military version of the Convair 340, a popular airliner in the mid-'50s. Just over 100 of them were built for the military in various configurations, and this one was delivered as a C-131D in 1954. The civilian versions numbered many more, especially if we count the "relatives," the Convair 240 and 440 (not to mention the turbine versions, the 540, 580 and 640). My references show 176 240s, 209 340s and 186 440s. One check ride is good for all three aircraft and three separate type ratings (CV-240 CV-340 CV-440)! What a deal for type rating collectors! 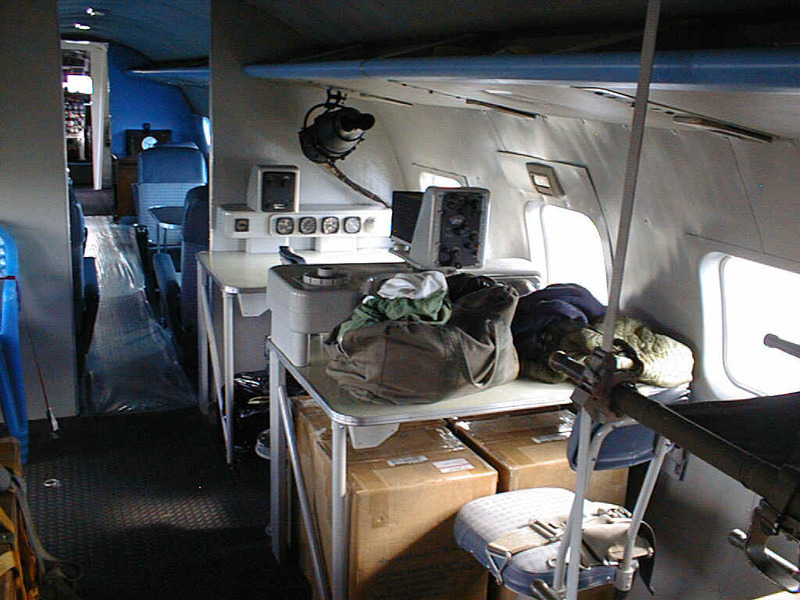 C-131 cabin, aft looking forward. The main concern of the Holms was keeping the airplane hangared and flying, and with some investigation, the SoCal Wing turned out to be the only place they felt qualified to do that. Scott lives nearby, and we think he may "closely supervise" our treatment of their "baby." After a little discussion, they simply gave it to us as a donation! What a magnificent gift! Along with countless spares, tools, and support equipment! Most of the airplanes in the CAF were donated, but few, if any, in such immaculate condition. This is the first "new" one I've been directly involved in, and the generosity overwhelms me. 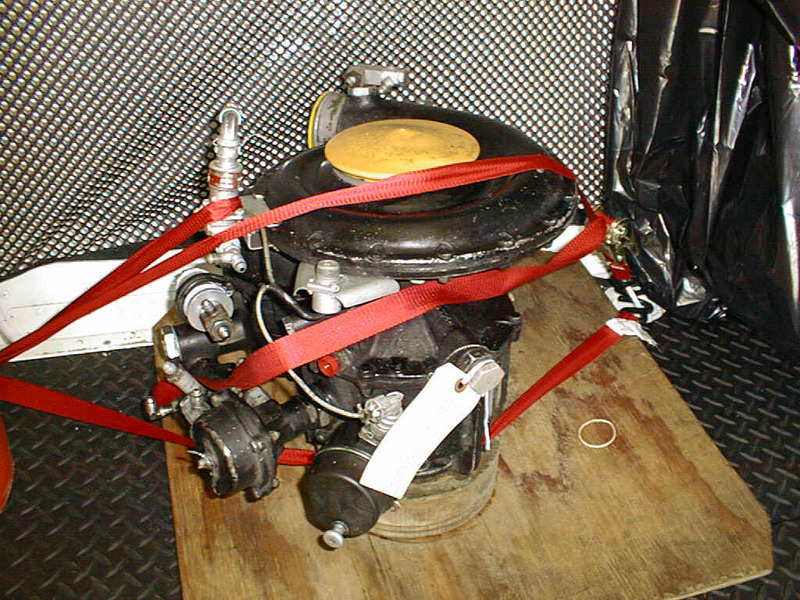 We were standing on the ramp in Florida, working on a minor mechanical problem, and Barry said, "Hey, I forgot, we've got a spare cabin compressor," and off he went to wheel it out. Brand-new overhauled unit, worth about $40,000 on the market, if you have to buy one! The first order of business was to go get it. 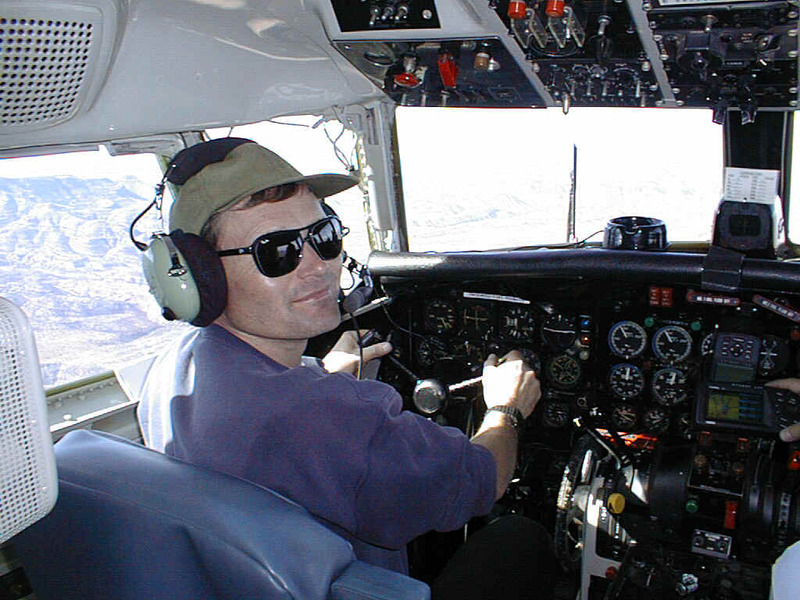 Our very own Kerry Bean, a current PIC on the C-46, was selected to command that operation, as he is already type-rated (in this very airplane, in fact). However, he was not current under FAR 61.68 (annual proficiency check), so he needed one to be legal. I can give the ride, even though I'm not type-rated myself, so I got selected (I resisted vigorously, of course) to go along and do his ride with Chuck Clapper, the previous pilot, in the right seat as instructor. They swapped seats, and I gave Chuck a fresh 61.58, though he wasn't due. Then I took the seat, and Chuck gave me my three circuits (one with a simulated engine failure), and made me legal as an SIC. We were hoping to get my training and type-rating ride done too, but we simply ran out of time, and there were no check pilots available (I can't give myself a ride, unfortunately). Kerry and I decided to fly the airplane to Camarillo, but a couple of mechanical delays made that impossible (Kerry had to go back to work), so we had to leave the airplane, and come back later. Special thanks must go to Kelvin Rautiola, who made the trip (twice!) to serve as crew chief on the way home. This is a very important position on all these big airplanes, as we've proven many times. The crew chief is not only a great help in-flight and on the ground, but goes back and scans the wings and engines every few minutes, as we cannot see problems from the cockpit. That has saved us more than a few engines, and Kelvin is one of the best of a great bunch. I had anticipated doing a column on the flight home, but there's not really much to tell. On Saturday, December 1, we launched from Stuart (KSUA) at about 0930 local, and had an absolutely routine, uneventful flight (7.1 hours) to Midland, Texas. The next day, we launched at about 0930 Midland time, and had another uneventful flight (5.5 hours) to Camarillo, Calif. The beauty just quietly snored along at 185 knots true, engines in perfect sync, everything working like factory new (well, the left oil quantity gauge fizzled, but that's easy to fix). There was a big storm blowing in from the north, but it held off long enough for us to land, even catching a big "sun break" just as we landed, much to the photographer's delight. The next project will be to get some training done. We'll probably get mine done first, along with the type rating (can't you just feel the resistance, oozing from every pore? ), then we need to do a ground school for a whole gang of people (at least three days, with Kerry and I sharing the duty), then we need to get some crews checked out, and soon! But where do we get them? 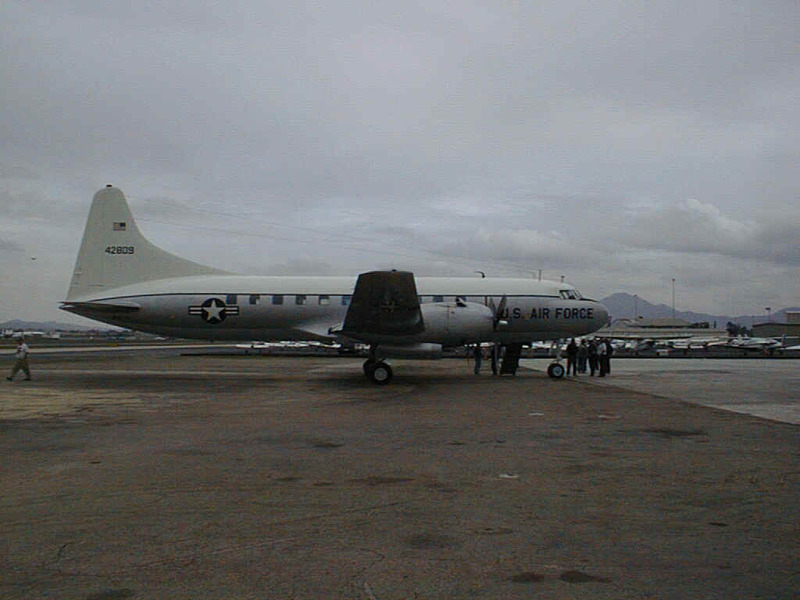 Due to moves and other factors, we're now down to only five qualified and active PICs on the C-46, and four SICs. All pilots fly other show airplanes, too, with several being the only pilots on other airplanes. If we book an airshow that wants all aircraft, we need all pilots to man them, and several have regular jobs, several are from out of town, and two live on the east coast! Toto, this ain't Kansas, and I think we have a problem here, we're anticipating 30 airshows next season! Sometime before that, we need to get several more PICs going on the C-131, a couple more on the C-46, and a whole slew of SICs on both. Anyone out there interested? Email me (but see below, first). No, there's no pay, we're all volunteers. In fact, it'll cost you some money, here and there. Put in a day as a volunteer, and you still pay for your coffee, twenty-five cents a cup. Since it all goes to the hangar fund, most of us chip in a buck or two per cup (only 400,000 cups to go). Hotel rooms are often paid by airshows, but sometimes individuals have to cough up the price of a room. Little things like that. But no big money is required. The old days are long gone. In the past, there were long lists of QUALIFIED and experienced people dying to fly and work on these old artifacts, no training needed. The lists were so long and folks so eager, the CAF set up a program of "Sponsorship," where members would donate $3,500 just to get on the "pilot, someday" list, with NO promise of ever getting ANY seat. There's no list, no mo'! Basically, anyone who shows up a few days a month, gets to know the gang, shows a willingness to participate, and wants a seat will pretty quickly get an evaluation ride, training, and a checkout, at least as SIC, without putting up any money (at least at SoCal, other units will have their own rules). Several talented folks have moved very quickly to the left seat of the C-46, in a few cases within a few months. We'd much rather put someone in the right seat for some time, perhaps a season, but our options are getting limited. If an individual can afford it, we ask for a donation towards training fuel, but even that seldom breaks even. We still require sponsorship to check out as PIC, but we're even starting to look hard at that. What are we looking for, in pilots? Basically, a commercial certificate, with instrument and multiengine ratings, 1,000 hours total time for SIC, and 1,500 hours for PIC. 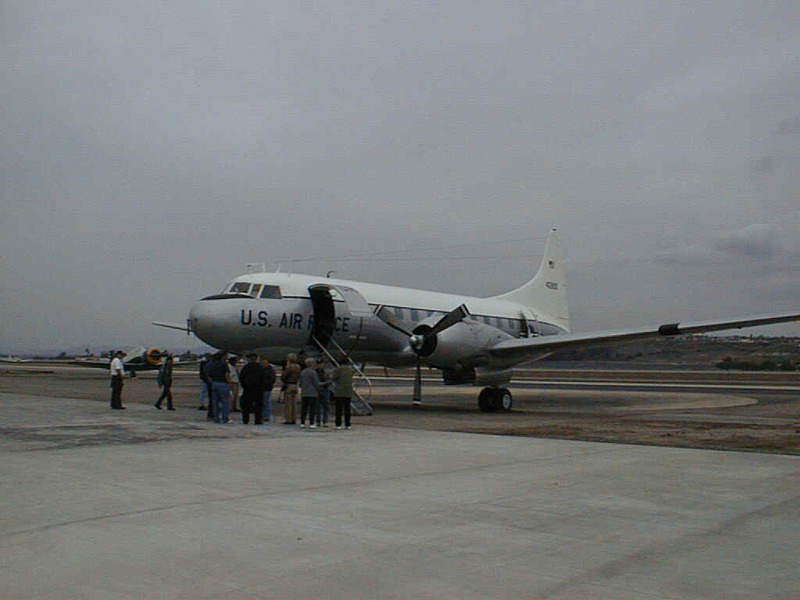 We've even had waivers for lower-time SICs, but I doubt we'll ever check anyone out in the C-46 or C-131 as PIC with only 1,500 hours, the airplanes are just too valuable. Recent radial engine experience is a major plus, but increasingly hard to find, so we're doing a lot of training, formal and informal, in that area. To fly the C-46, it's almost mandatory that a prospective pilot learned to fly in tailwheel aircraft, or be very, very quick to learn how to use their feet. If we can check out a copilot in an hour or two, that's fine, but if it's going to take longer, we can't afford the training time. The airplane is a wonderful, docile old girl in the air, but she's a nightmare when the rubber meets the runway. The systems are dirt-simple, so ground school is a two-day course, with short days, and only about a day of that is on systems. On the other hand, the Convair is a baby buggy to fly in all respects, but a VERY complicated aircraft, with many systems and procedures, and will require a great deal of study for those not already familiar with such machinery. We're planning at least three days of intensive ground school for people who already know a lot about these old engines and aircraft, and that will have to be backed up with some very serious self-study. We do all the instructing and check rides in-house, with Kerry volunteering to lead the C-131 training program (though he doesn't know it, yet), and I'll be helping with training and checking too. Kerry is a senior captain for a major airline, and one of the training managers on an Airbus type, though we try hard not to hold that against him. At least that's partially offset by the fact he got his start flying night cargo in Twin Beeches. Now, THERE is experience I like! He's also a licensed undertaker with a sense of humor that drove him out of that business, so he's a real kick to be around. Hey, as I said, we need all types! We have not yet used his undertaker talents. All that said, let's be honest, here. No one is going to show up today, get a quickie ground school and training, a quick type rating, and be a PIC in a week or two. Even with the best of people, new folks need to show up a few times, get to be known personally, show that they can represent the Commemorative Air Force in highly visible public appearances (TV interviews are fairly common), work with all volunteers, and above all, fly these priceless artifacts safely, PROFESSIONALLY. We may not come up to airline standards, but we don't miss 'em much, either. The biggest problem is travel. I know a dozen people that would love to fly with us, but the distance and cost of regular travel from their homes to Camarillo just defeats them. Frankly, the best deal is for airline pilots, both active and retired, because they can travel free, or at very low cost, and many of the retired types do have the time to participate. The downside of that is that once most active pros put in 85 hours on the job, there is little energy left to go fly other airplanes, and families often have needs, too. Most of all, we're looking for YOUNG people, defined as anyone under 60. Seriously, we've got to get more younger folks into these airplanes, pilots in their thirties and forties, or there is simply no flying future for them. The expertise is rapidly being lost, and there's very little training going on, except in those smelly jets. 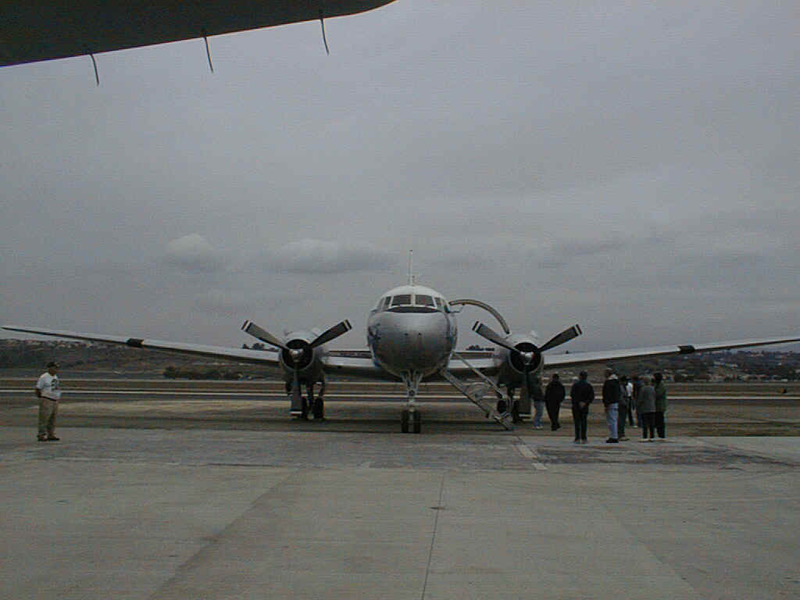 I often hear people ask, "Why don't you check old so-and-so out in the C-46, he flew 'em, years ago?" "Sure, how old is he?" "Oh, I think he's 74." That's our problem. Old so-and-so has forgotten everything he ever knew about C-46s, and all the other old recips. He may even be able to check out, but is he going to teach? Will he give away 80% of the landings, as most of us do? If he doesn't, he is occupying a precious seat that someone else could be training in, developing experience that he can later pass on. I wish I knew the answers. If anyone out there can help me/us, email me, please! Next month, I'll go into the airplane a little bit, by putting up the expanded normal checklist here, and some of the design philosophy that went into it. 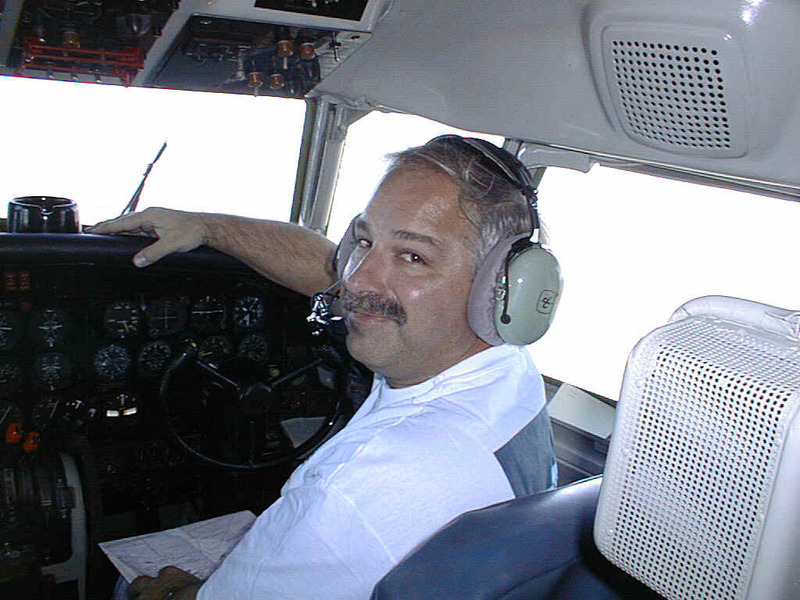 John Deakin is a 35,000-hour pilot who worked his way up the aviation food chain via charter, corporate, and cargo flying; spent five years in Southeast Asia with Air America; 33 years with Japan Airlines, mostly as a 747 captain; and is now flying Gulfstream IVs as a contract pilot. He also flies his own V35 Bonanza (N1BE) and is very active in the warbird and vintage aircraft scene, flying the C-46, M-404, DC-3, F8F Bearcat, Constellation, B-29, and others. He is also a National Designated Pilot Examiner (NDPER), able to give type ratings and check rides on 43 different "vintage" aircraft.